Discussion in 'Pacific Northwet - Where it's green. And wet.' started by Apple Jam, Feb 2, 2015. Since sometime in 2011, I started working on a Dual Sport Motorcycle Adventure Route that leaves from the Hood River area and heads South to meet up at Big Lake, near Sisters, OR, where OBCDR Routes #3 & #4 take up. 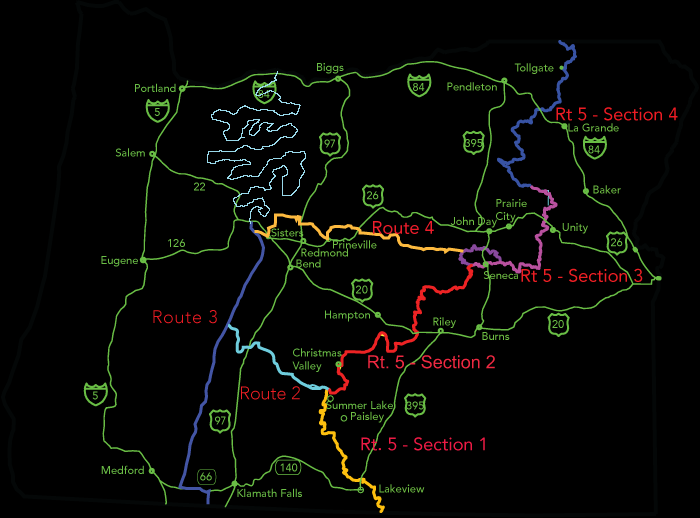 In my opinion, this 300+ miles of bad road goodness is the missing "Route 1" of the original Oregon BDR series. I wish to make this Cascade Discovery Route a NW-ADV thing. I worked hard finding these gems of bad roads and connecting them all together, and I wanna share it with ADV so it can be cleared, used, and RIDDEN !!...regularly. 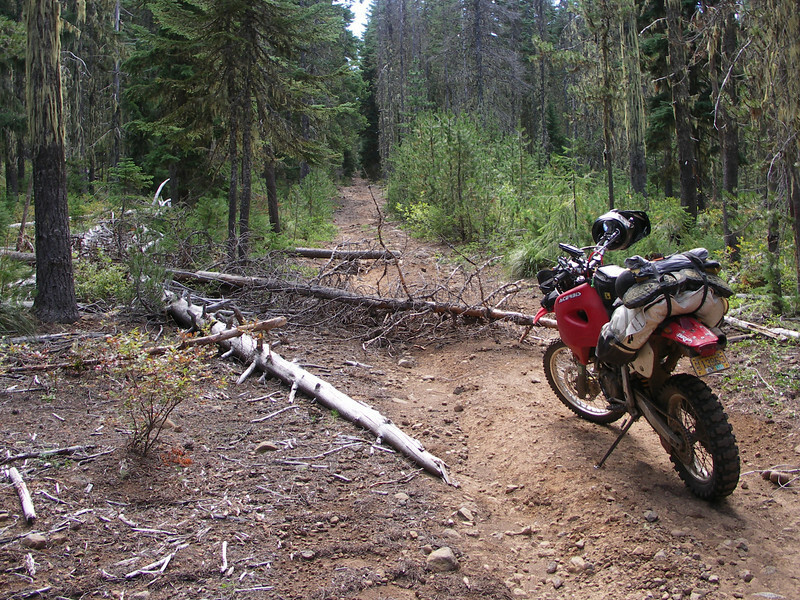 I have complete tracks now for Cascade Discovery Route's "Pinemont OHV to Big Lake". This Route will remain a work-in-progress, so check back for freshly posted tracks. We have some other interested ADVers working on "CDR Act II" whom wish to complete a very similar type of Route South from Big Lake to the Cali border, offering a more Cascades oriented alternative path than the OBDR Route 3. 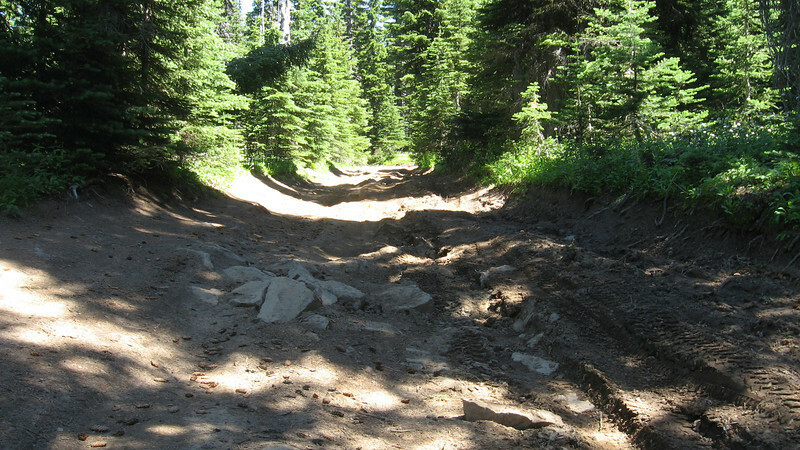 The Cascade Discovery Route is the long and hard way from near Hood River (Pinemont OHV) to near Sisters (Big Lake), it takes up over 300 miles on the way, trying to find the best (bad!) 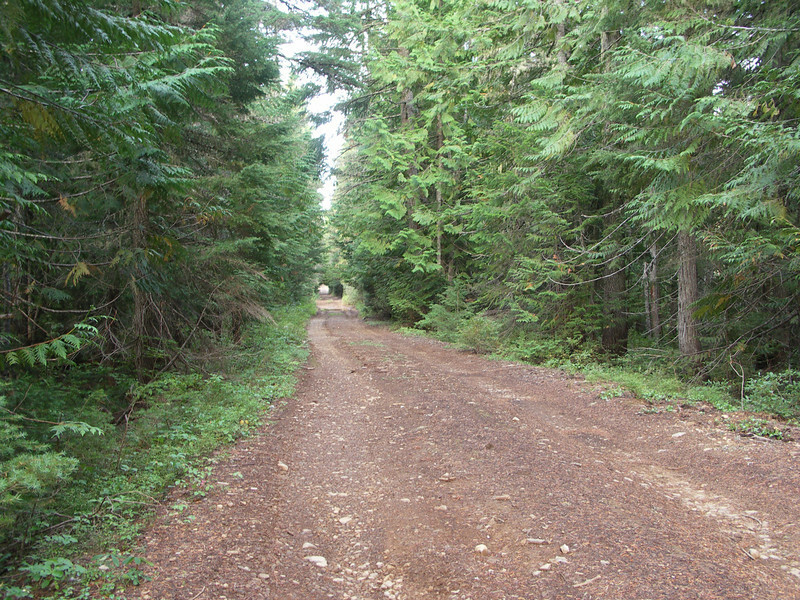 dirt-only roads and travels on several old historic wagon roads along the way. These are the dirt-only roads that came BEFORE the FS Development gravel roads, and have NEVER been improved. It is not a quick juant, nor an easy one. It has taken a couple of rather experienced riders a full three day & nights to get there, and three more to get back, stopping lots and camping fairly early. It has also been done solo in 11 hours riding time (one-way). It is a Big Bike friendly route,.....if you wanna work hard, and have some serious challenges along the way, and don't mind broken blinkers and scratches. That said, some Big Bike riders will absolutely HATE it, and likely curse me for calling such nastiness "fun". It is Small Bike friendly, too, in that it has less than 10 miles of pavement in that 300+ miles, and these are mostly just for the required gas stops, and a few one-lane paved forest gems for short stints. This 300+ mile Route also rides some fast gravel roads South of Detroit Lake, and avoids any pavement all along the way (which is the MAIN goal). This Route passes adjacent to, as in ....you get to ride the great bad border roads,...to four designated Wilderness areas, areas that only a few special people like yourselves get to see at all. You get to ride miles and miles and miles of it. While I have already found a great set of bad and beautiful roads, there is always something better out there, so I want this Route to evolve and include it if it can be reached by dirt. I wanna add optional sections with great rough out-and-backs, dead ends with a view rewards, you know...the good stuff that riders wanna ride. So please send me info on any bad road sweetness we may be passing close to. The only payment for using these tracks is that you MUST put up some type of a Ride Report here on this thread, no matter how simple, to tell us a bit about your experience. But please, elaborate, post alotta pictures, and do it up right, willyas? Many thanks to Rob.G for setting up and hosting our website. This is a Great help to me, an analog old guy; no digital native am I.
I wanna see your Ride Report in this thread !!!! Hambino, Stromius, ArrinD and 2 others like this. In the Mustard Booyah. Whooop!! Good on you for sharing AJ! I'd give you a suggestion of how to share those, but I've never used a GPS. All those Bend to wherever in Oregon routes I've found over the years are stuck in my head. It stays just south of the Warm Springs reservation doesn't it? That's always been a tough spot to navigate around. Lot's of dead ends out there. Thanks for sharing your hard work with the rest of us I know it was a labor of love and a lot of research. Shoot, Walla Walla to Lakeview is only 2.5 days if you twist that thing on the right. Next step? Start sharing your tracks and we'll start riding it. The fun parts of the Route stick to just barely West of the Warm Springs Res, and on South down to where it hits the Jefferson Wilderness near the Olallie Lakes area. The only long gravel road sections are just West of Hwy 22, South of Detroit to the Santiam Pass. I tried for many days, but only basic gravel West of Hwy 22 (lots of closed gates through there) and nothing goes through to the East of Hwy 22. This was all just in my head for the first three years, and I also prefer to just ride it by memory. The GPS tracks I have now are from other riders with me on the Route. I still ride the BOP. Bigger and more fun than any BRP. I wanna put the tracks I currently have here on this thread, how do I link them? They do need some clean-up, I have yet to master and don't enjoy using Basecamp. You got most of Day 1 of this Route (minus some newer additions ) on the way to the Bend KTM Rally. Congrats on selling the bike, hope your new 690 is all you think it is. I do expect it will be the best bike for everything but those rare 200+ miles slab runs. But, how big of a cooler can it really carry? I'm pumped for this AJ! Exactly what i've been looking for, I want to go do it now!!!! I make all my routes with ridewithgps. You have to sign up to make routes and save routes online. You can export them in all the popular formats. You can also route off of roads if needed. I'd be happy to help if I can! Portland...the newer one on the left side. AJ - If it were me, I'd add files for both "Tracks and Routes" to your existing Cascade Discovery Route site under the links section. It looks like there is a file download manager available for WordPress, else sign up for a DropBox and put the link on that page (and here if you want). You might also setup a PayPal account on there and use it for "Donations". Put a story on there that dontations are used to cover the initial creationa and provided you get some, ongoing communication of the route (re-routes, updates that kind of thing). Sort of the old "Shareware" model - if you use it, pay for it. The above should only be a couple of hours worth of work to setup. All the other fancier stuff you may have wanted to do on that could happen later if you get some donations. Want to spend even less time? Update the above site and tell people to e-mail you (along with a small donation of their choosing) and you will e-mail them back with an attachment of the Routes and Tracks file to cover your time. FWIW - I loved MapSource and Hated Base Camp, but the more I work with it, the more I've gotten use to it for creating routes/managing tracks. Happy to test troubleshoot what you come up with. This is awesome. Can't thank you enough for wanting to share this priceless info with us. I will be watching this thread closely, wish I could help with the GPS knowledge but I am a noob as well. Thank you!! I really want an interactive map on this thread somewhere where we can all include lots of pictures of the campspots, bad roads, and views along the way. With a group contribution, we can photo-document the Route pretty well. It should also include the gas stops, grocery and liquor stores en-route. Links and clickys, that kinda thing. 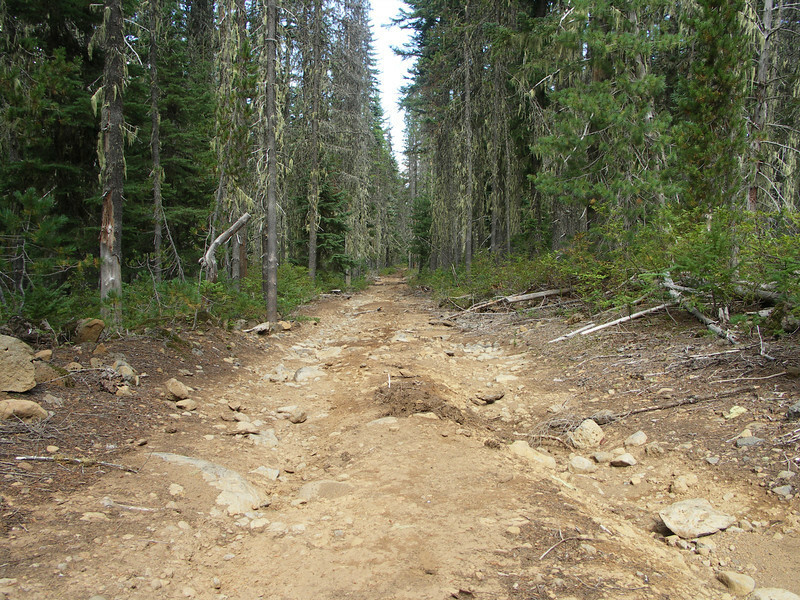 I thought about going South of the Res and into the Metolius area, but there are no dirt connectors from the West side of the Jefferson Wilderness. I wanna avoid any kind of a run on the big highways. I thought about much of that,...when I was underemployed and had more time. I don't wanna maintain any kind of a site, because I don't really like computers and figuring stuff out on them. I'm more of a hands-on kinda mechanical guy. And I don't wanna be in the position to get a bunch of PMs that I need to email responses back to. I don't want to accept donations, because with that comes expectations. I will likely disappoint, so I'd rather avoid that :d I also don't feel it's right to charge a fee for something half-accomplished, and I don't wanna research and finish this alone. So,...enter ADV and free. Free with your help as ADV volunteers for the computer work, and my time here to organize it. I've put together sections from Bend to Detroit, but like you said, they're all on the west side of the highway. Honestly when we go to your place we usually slab it from Sisters to Idanha mostly because of time restraints. I've tried and tried and tried on the east side. But I've always hit the reservation, wilderness, or dead ends. Pretty sure some of your route goes through the CDT doesn't it? Fun stuff! Cross District Trail. Sno Mo in the winter. I know you've ridden it.